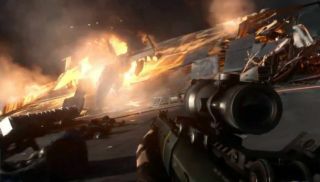 EA showed up at the Xbox One press conference with a brand new Battlefield 4 gameplay trailer featuring a snippet from a singleplayer mission aboard a carrier. On display were switchable gun-sights and a ridiculous number of explosions—grenades, cannons and even runaway bombs. Multiplayer is noticeably absent from the video, but there's plenty of Call of Duty-style dramatic set piece moments—at one point, a jet is dropped on a group of enemies by shooting at some red barrels. Does anyone else see the backspace prompt for Battlelog in the top right of the screen? It looks to me like the PC version will be getting some loving, although the first map pack will be available on Xbox One ahead of the other platforms.